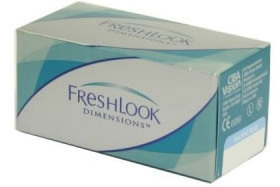 Or $6.00 per contact lens (x6 per box). Or $6.86 per contact lens (x6 per box). 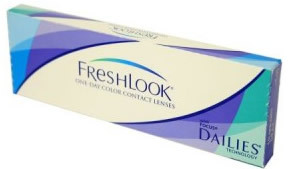 Or $1.44 per contact lens (x10 per box). Or $7.50 per contact lens (x6 per box). Even if you don’t need vision correction, you can change your appearance in an instant thanks to FreshLook Contact Lenses. This line of products from Ciba Vision gives you the color you’re after in a comfortable lens that’s fun to wear. If you do happen to need vision correction, too, Ciba Vision still has you covered with this line. 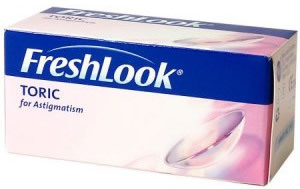 FreshLook contact lenses are designed to change, highlight and illuminate your eyes. You can choose from a variety of color combinations. Though you don’t necessarily need to have corrective vision, it is still a must that you undergo an eye exam and check-up for an eye doctor to be able to prescribe the right pair of contact lenses for you. You can even try on a pair for free at your local eye clinic. This extensive family of products from Ciba Vision also includes FreshLook Dimensions, FreshLook Radiance and FreshLook Toric. No matter what color you’d like to switch to, you’ll find this line delivers. 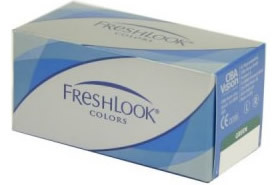 From basic blue, gray, green and honey to hazel and beyond, FreshLook contact lenses have the colors you’re after. There are even more exotic options available like Caribbean Aqua, Moonlight and Eden and Sunrise. If it’s time to change the way you look, this Ciba Vision line delivers plenty of choices. To order contacts online and save money in the process, rely on us to help. At PriceContactLenses.com, it’s our business to help you find the lowest priced discount contact lenses from the top makers in the industry. 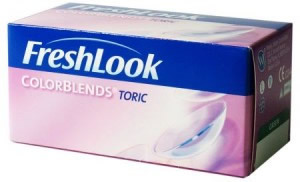 There’s no reason to pay more for FreshLook contact lenses when we can help you find the best deals from top online retailers.